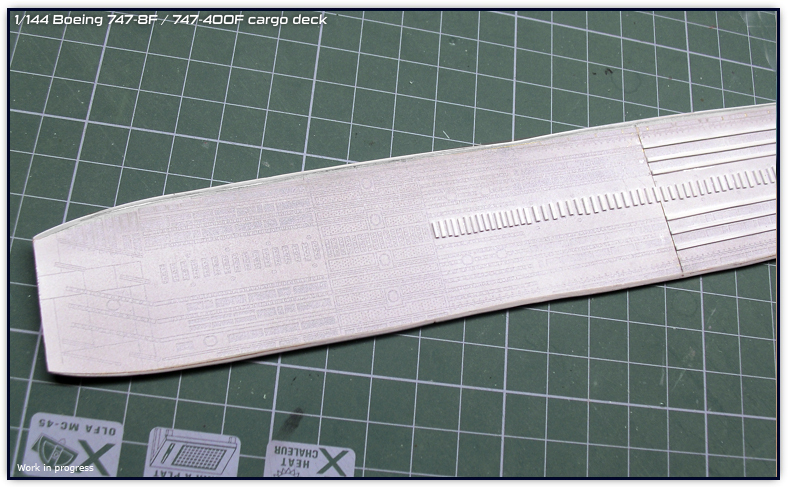 This page will show the process of the cargo deck for the B747-8F in 1/144 scale. Main goal for this build will be to detail the open nose door together with the full cargo deck and side cargo door open. As I commented on the previous entry, today I would like to upload some of the process I made during the last days on regards the 747F project. 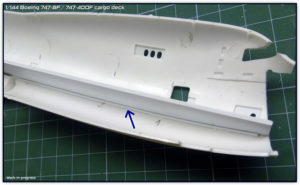 The cargo door still requires more details on the inner side, the two arms as well as some bits of wiring, the rollers etc. There are some minor differences on the panel between the -400F and the -8F, there are also some differences in the deck (besides the lenght) so I will work on the -400F variant later on once I have completed the 8F. In the previous entries I comment on the issue I had with this particular area of the door frame, now that I have attached (only for reference) the door, I can see that the inner cover has to have an empty space, like a notch so to represent the space needed for the door to fit once supposedly closed. 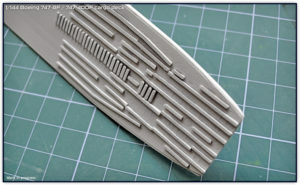 There is also going to be all that detail for the reinforcement of the fuselage for the door. Still work to do on the union between the door/fuselage, as I comment before, I need to correct that area. Now that I have more or less figured out the SCD, it is time to plan very carefully the interior of this beast. Unlike a house, I will start from the roof, I will do so by continuing and modifying the cockpit floor, extending it to the resting area, there, it cuts and a second ceiling is visible. 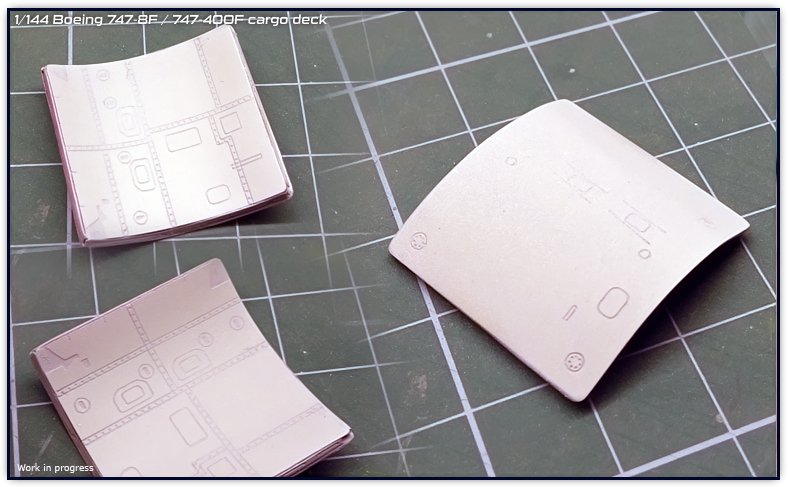 Having the mark of the deck level and having later the level of the ceiling, I will be able to see clearer where the side panels and their detail will go. 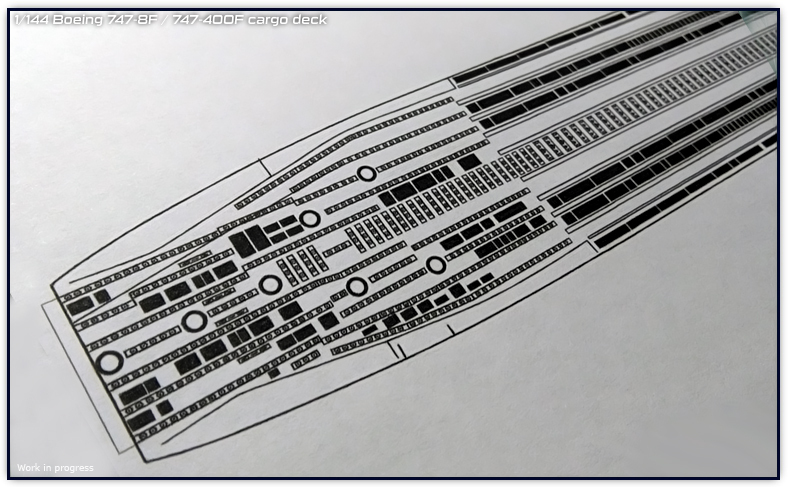 There is a Zvezda 747-8i on the way as I would like to do a port from this build in order to be placed on the Zvezda kit, as for somebody it may be easier to find a Zvezda kit than a Revell one, I also would like to do this port to open posibilities for those who prefer to work on Zvezda kits. It will be a challenge because both kits are completely different, a lot of surgery to do, but the Zvezda version will come later once the Revell variant is completed. Within the next couple days I hope to upload some of the progress done on the livery decals. 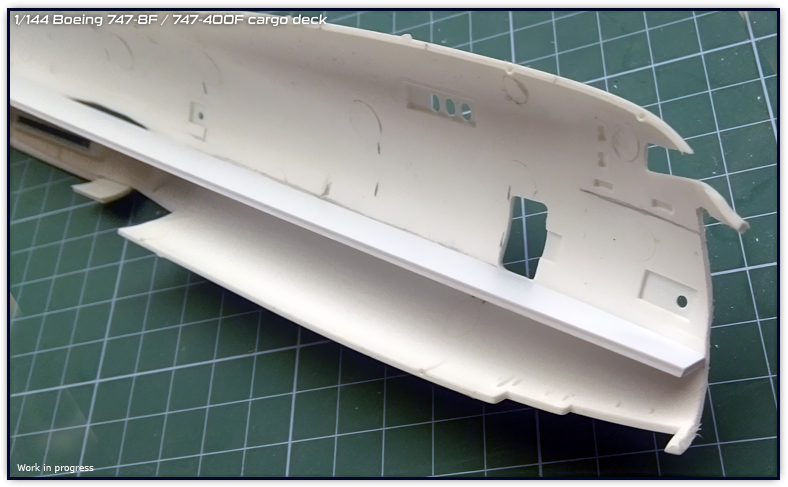 I have been able to start working a little bit on the side cargo door and the first thing to do was to research the actual 1/1 inner space dimensions. This has been quite interesting to start, at simple sight when the door is closed, it looks taller, but the actual opening looks more squarish. This is because of the space required for the rollers and the top cover where the two mechanisms are located, so the door actually sits on these areas as well as in the small frame around the opening. It may be a little complicated to explain, but I hope to work on the next steps and have myself a better view and understanding. At the beginning I thought that the original kit’s door dimension was wrong, but I do believe it was right. The next photo does not show much but that I have started working with this area. 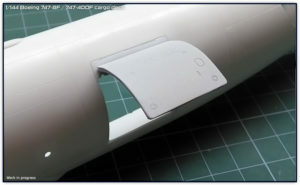 Actually I had to include plastic on the sides of the opening as well in order to keep the dimensions in scale. 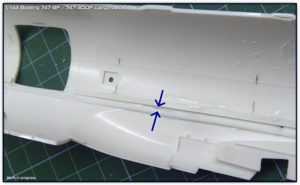 The brighter area is a plastic portion I placed that will be used as a guide to know where that cover and hinges will go, door will cover that area somewhat once shown in opened position. I am not a big fan of real lights on scale models but I am a little curious in this case, because this cargo will have all its deck visible, I may try to add a few leds or a small led stripe on the ciling as I can imagine this freighter being loaded at dusk. To me it was important to start another area and leave aside for a moment the deck itself. In fact, it was needed because once I start working on the interior panels, I would already like to have the door opening done. I also must say that in order to not to forget why do I love to do what I do, I must find the time to build a completed model (A320) to fully and finally test the new decals that I am re adjusting. I have changed the distribution of the artwork so that it is easier to locate things, easier to understand what is what, I am still far from finishing adjusting all the artworks but I am on the way. Motivation is very important in this aspect to keep working on projects, it is already hard to stay focused onto two projects such as this one and the B737NG cockpit and as a matter of fact, I found out that I am not good at combining both projects, mostly because it is always plan ahead. I am working on stock units every day, it requires a lot of time and dedication, but I like it very much, only that I do not want to forget the essence of scale models, for this reason I think that the next A320 is not only going to be used as a test for the new decals, but also a project that I need to do to keep my dreams alive. More updates on the next weekend! This weekend I have been able to advance a little bit more with the deck of the 747 cargo project. 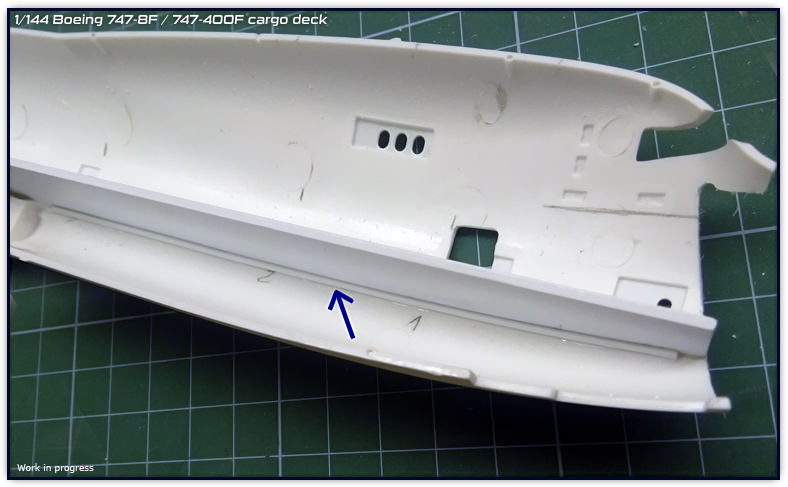 There is still a lot to include on the cargo deck, I am advancing from the front to the rear and I am now reaching the side cargo door platform which will have some different details than the ones repeated on the long deck. 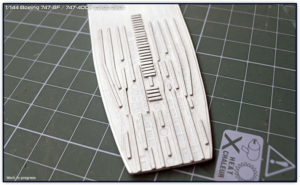 So far I am using small stripes of plastic, but I will add more detail to them as they are now just flat. 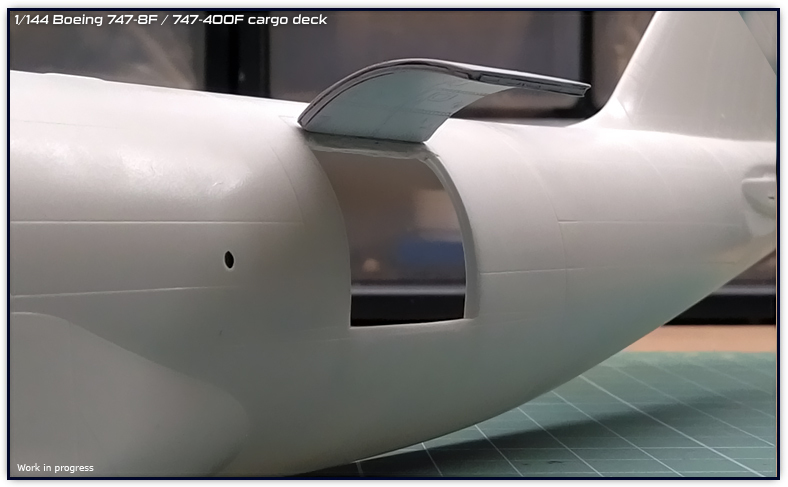 There is still some progress to do on this cargo deck, but the fuselage is ready to hold it on the inside, once the deck is finished, I will work on the interior panels. I am not forgetting the cargo holds which I would also like to represent. On my next update I wish to have added the side cargo door platform and some more small parts. Finally I have the materials needed to thoroughly continue with more decal print tests, there is going to be a lot of work to adapt the artworks made so far in order to be printed with my current tools, I am also planning to make a quick out of box build in order to test these decals and give a proper review. I have found nothing but rocks on my way to be able to print decals, but now I am able to do these tests that are a must, so from this point onwards I will be working on the artworks and with hopes to continue designing new ones soon. 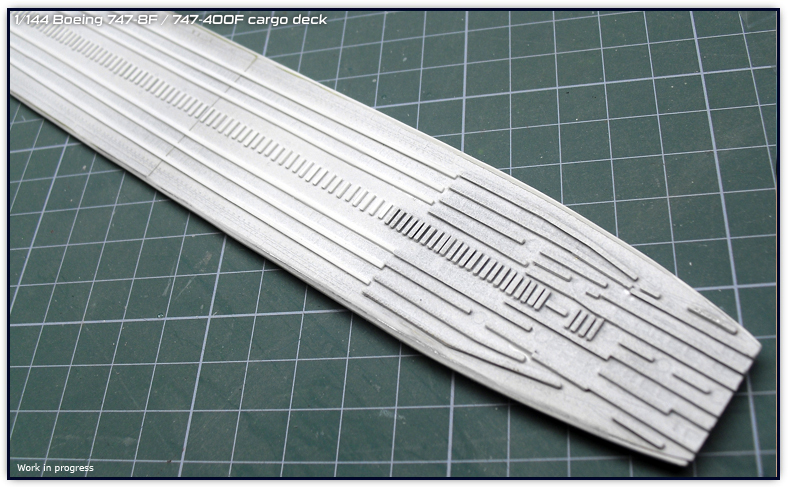 I have been able to start the work on the cargo deck. At first I thought to leave the deck floor flat with just the engraving but then I thought to give a bit more volume and add all the several rails. I would like to mention that all these are not placed randomly, they follow the same structure as the B747-8F deck. I was able to gather lots of reference photos so I am trying to reproduce everything I see. 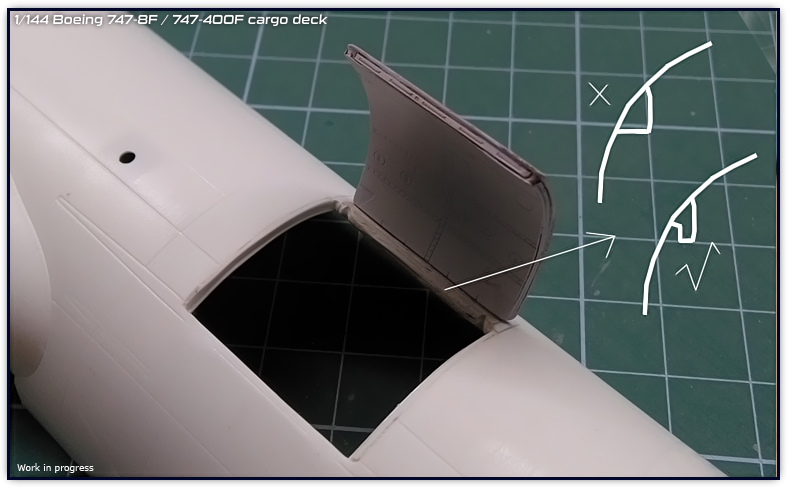 It has been quite difficult to make a joining structure on the inside of the fuselage in order to place the entire deck, but currently it fits well. I had to fine tune and sand down the width to make sure both fuselage halves close properly. In the photos you may see a small gap between both fuselage halves and that is because they are not glued yet, both halves can be closed properly without the deck causing any issue. 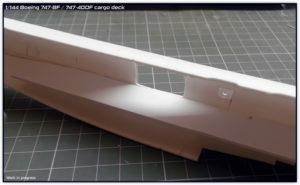 The structure under the deck in the nose area will be very important as it will help the deck to be placed properly and will be an area with several details. This area can be seen in the last photo as a darkened area. 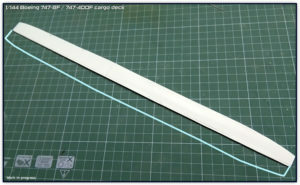 The rails have a thickness of 0,6mm which would be translated into approximately 84,6mm in the real aircraft. I think that 8cm would be a close match with the actual railing heights. 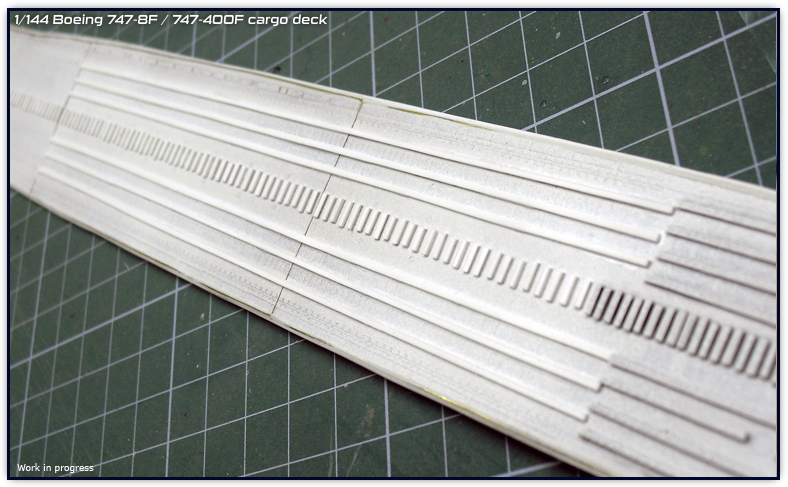 Since the engravings and details of the deck/rails are quite small, I was at first thinking to create decals for the anti skid sections only (refer to the black rectangles on the previous project entry), however, I may also be making decals for the rails to highlight their details. 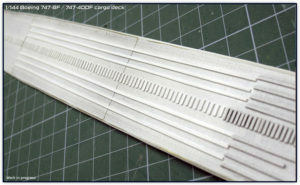 It would be a challenge to decal though, due the dimension of these small rails, but I may give it a try. 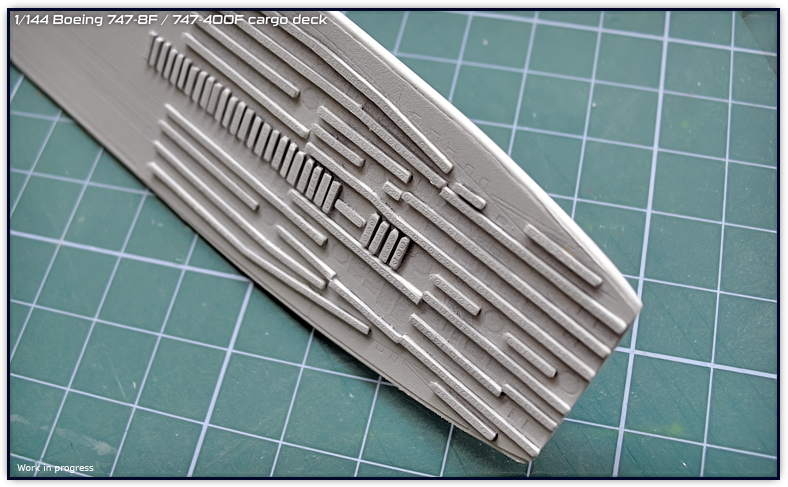 However, I also keep in mind the 100+ small sections going across the deck, so perhaps a painting technique such as the dry brush would also give a good result instead of adding 100+ tiny decals. During this week I will be working on new stock and I will start to prepare the next step of the B737 cockpit which I hope to continue and update on the next week. 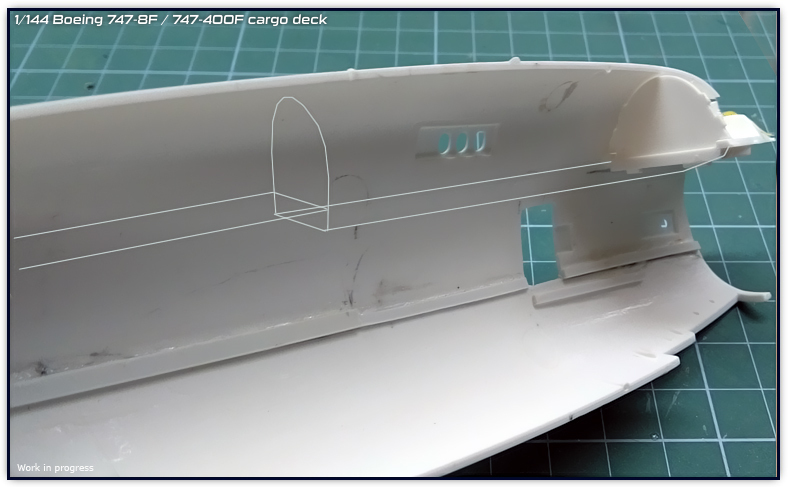 I have been able to overcome what I think was one the most critical points of the B747F cargo set, which was to make the main cargo deck (base shape) and actually be able to create a sort of guide for it to be attached to the fuselage. I don’t have many photos but I wanted to share one that shows the detail that the deck will have, so far the details are designed with the computer and yet to be placed on the deck itself. The set will also include decals, so I have been taking note of the different letters and marks that go on the side walls. I noticed some differences between the 747-8F and 747-400F deck systems, the 8F is using some wheels to guide the cargo into the deck, so I may rework that area for the 747-400F set. As a personal note I would like to say that temperatures and humidity are not helping me to work with everything as I would like to, it is not a personal complain but more a technical issue since humidity makes things harder to work with. August has been a messy month, so from September I expect to have a more solid schedule and be able to do things in a better order. The change of decals is more work piled to do, but I am sorting that out. 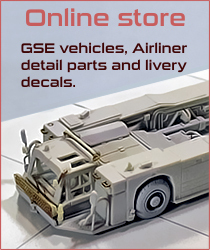 Up until now I did not have a catalogue and projects to work with alongside, so I need to set a schedule to designate time for both, keeping the store with items and work with new projects and decal liveries. I know that if I run to do things, there will be bad results, so I repeat myself that I need to take the time that it takes to do it right, there is no such thing as rush into modeling and specially when you are offering your work to the public, so things must be 100% correct. Will be representing the Air China’s A350 with the 2019 Horticultural Expo colors, I think this one will be a good decal testbed, since it will have big and small decals, colorful ones, blacks and also white decals. 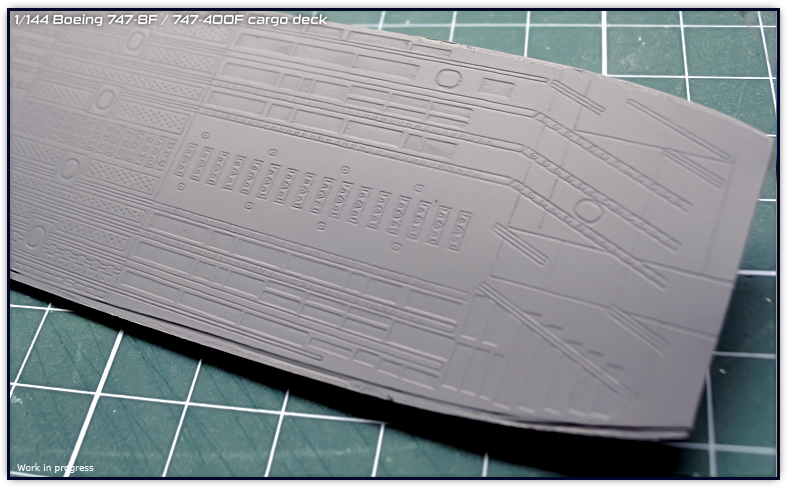 After starting the decal tests with the new printer, I am also trying to advance step by step with the B747F cargo deck project. Before I get into more details about the cargo project, I am glad to say that I was able to improve the results over the first tests with the livery decals. Currently fixing the A350 decals, I’ve been able to make appear again the cockpit rivets and other fonts (such as those on the doors) which were way too subltle on the first tests, so I am glad to see that details are back, printer was also able to print the very thin subtle colored lines such as those for the cargo doors. There have been several modifications done onto the corrected (reaconditioned) A350 decal sheet in order for them to be printed with the different equipment, so instead of reworking all the liveries done so far, I will apply the airline decals onto the A350 base sheet as I did while creating the artworks, expect to do the tests for the A320 soon. It will take some time to complete this, but I go step by step. The positive aspect of printing the decals myself is that I am able to do as many tests as needed in order to be certain that details will be well represented, color tonality etc. I will soon take pictures of the decal test print. I also had to learn the hard way some things, so I had to purchase more decal paper, but I learned from my errors and I am able to continue. 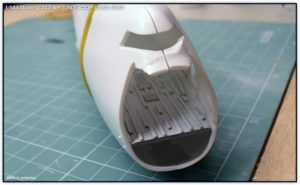 As I was afraid, I had to remove a part of the inner fuselage where the wing goes, in order to keep the floor straight. I wanted to mess as little as possible with the fuselage, the wing root will also need a small cut, this is something that had to be done because the way Revell designed the wing union, did not have into consideration the interior space (as there is no interior in the kit). One of the things I had to decide was how to work on the interior. The first idea was to create the interior separately and then place it on the inside of the fuselage, however, many things depend on the fuselage. For starters, the nose area will have detail which is attached directly on the wall itself, wing root needed the cut modification, L1 and SC doors have been opened, also, due the roof required on the compartment, the cockpit plastic part will be modified and extended as per the hump room/resting room. Another dependant situation is the attachment of the cargo deck, for which I made two rails with the purpose of deck placement. The best solution and the more accurate one is to work directly on the fuselage. This will ease things for me and will allow me to make a better representation of what I try to do, it would be very hard to make the parts in such a way they would fit the shape of the fuselage, latches and actuators are placed directly on top of the nose cut, so I prefer to leave the fuselage ready in this aspect. Side cargo door opening edges will also be sanded down to reduce plastic thickness and create a more realistic scale effect with the real airplane. 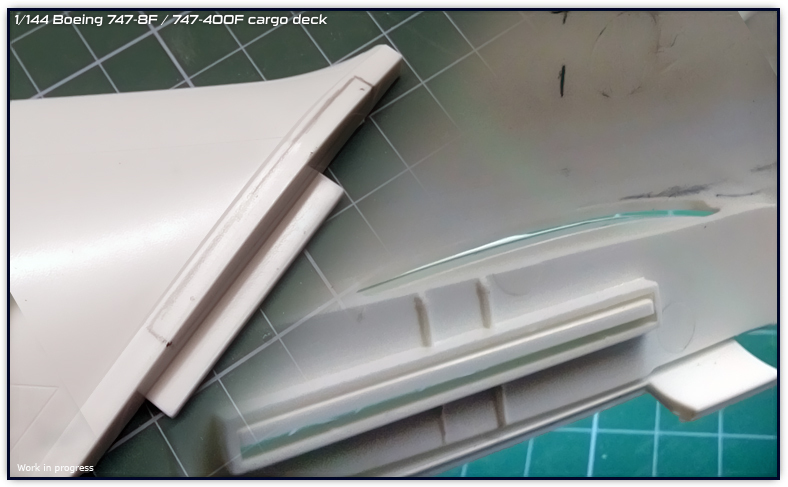 At the same time I was cutting the L1 and the side cargo door, I thought that while I was at it, it would not be a bad idea to open the other cargo doors since I was already adding the cargo deck. Thus this would be a completely full door set. 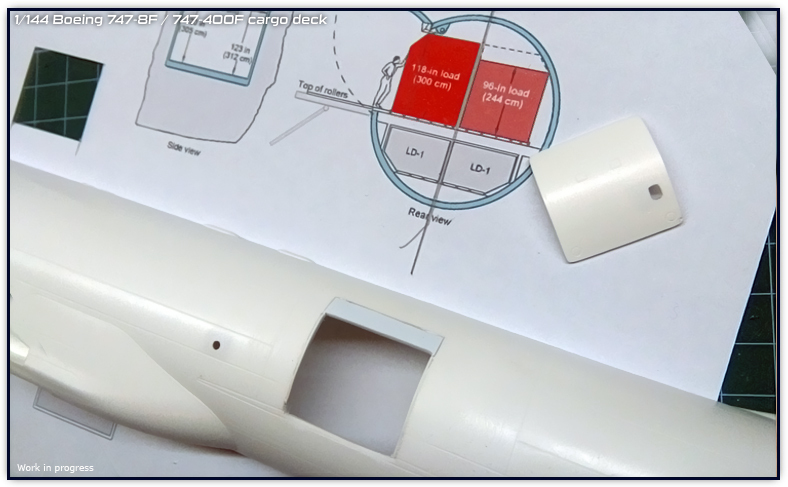 Perhaps it will be more costly for me to cast 85% of the fuselage with the full interior in it, but it will be easier for the modeler in order to avoid adjusting so many things, such as cutting the hump. So basically it would be closer to just builiding the two fuselage halves but with the interior. Of course having to make bigger molds will also represent using more materials, but I have in mind to use some additives to lessen the cost. One of the negatives of doing such a big conversion, is that this one cannot be used with the Zvezda kit (at the moment) and only with the Revell 747-8i or 747-8F. However, if things go well and I can overcome the initial costs, I may do a surgery to the fuselage and replace the wing root and nose gear sections so that the interior can also be used for the 747-8i from Zvezda with Zvezda wing and nose gear unions. 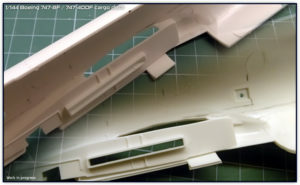 For the 747-400F version, instead of re casting the fuselage and deck again, it would be specified in the instructions where to cut and what parts to use to make the shortened version. Making half of the deck wasn’t easy because firstly I had to find the shape of the fuselage (on the interior) and another difficult aspect was to perfectly match the half of the airplane. If the deck was too wide, the fuselage halves won’t close, if it was too narrow, the deck would not join both fuselages. By doing several tests, gluing the deck on one fuselage halve and placing this on a flat surface, I was able to find the center. Now that I have one half of the deck, I will proceed to make the exact same part to make the other half and join them together. The deck will carry as many details as possible, so I am looking forward to work on this area.